Meet Rae, my granddog, if she must have a title. She is a member of my daughter’s family, rescued as a puppy from an accidental litter of racing dogs. Even though I don’t see her very often, I think Rae remembers me – or at least quickly accomodates to my presence. By nature her breed tolerates limited activity and being housebound quite well. Strange when you consider they are also built for such extreme activity as racing. Rae stays home while her family goes to work each day. She sleeps and waits (and who knows what else, since no one is there…) When I’m around she likes to be near me and “dogs” me everywhere I go. She even prefers to sleep with her humans and in the few days I’ve been here she is already habitually following me to bed each night. 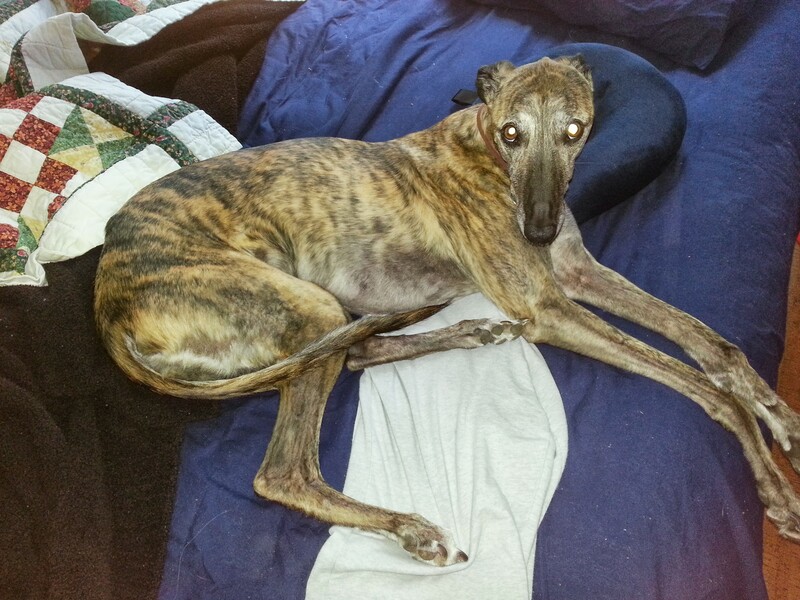 A greyhound is a different looking dog, being alarmingly skinny and bony. You have to get used to them looking more like a deer or some other long legged creature with a pointy nose. They are not very hairy and they get cold easily. Rae likes soft, cushy places and doesn’t mind having a blanket or two. She had a childhood accident which left her with a twisted front leg. We think it probably hurts her a little, but in spite of it she loves to play fetch and run for short periods of time. I like to take pictures of her. She is prone to “red eye” and a glowing countenance which I think makes her look spooky, like the hound of the Baskervilles. She is a sweet, gentle dog. She remembers me and I like her a lot. She is the color of our beloved Boxer, Boone.